My friend John Wells of Vintage Torque is a man on a mission. Both his hugely successful Vintage Torque Fest and Iron Invasion shows raise money for HelpingHannahsHeart.org and he’s not stopping there. 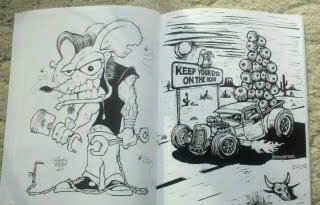 Also available as a fund raiser are 2 coloring books, I just ordered a couple of the new Asphalt Fiends Coloring Books for gifts for my nephews for Christmas (they are 3 and 5 and I don’t think they read this blog so I am not ruining their surprise). HelpingHannahsHeart.org is a foundation to help families who are dealing with the financial burden that comes from having a child with Critical Aortic Stenosis or related Congenital Heart Defects. The Wells family knows all too well what this financial burden looks like, this is their way of helping others going through the same thing. The coloring books are a veritable who’s who of the hot rod art world. Page after page of heavy hitter artists lending their art in a coloring book line art form. 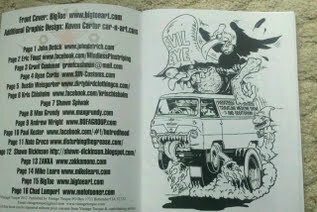 The 2014 edition features art from Zombie, John Detich, Eric Foust, Grant Cushman, Ryan Curtis, Dustin Weisgerber, Kris Chisholm, Shawn Spiwak, Max Grundy, Andrew Wright, Paul Kester, Nate Greco, Shawn Dickinson, ZAKKA, Mike Learn, BigToe, Chad Lambert, Joey Finz, Mark Thompson, Bruce Gossett, Chad Scheres, Scott Fisk, Jeff Gaither, Johnny Jalopy, Corrie Erickson, Jim Hively, Ben DragDaddys Mitchell, BOMONSTER, Del Swanson, Sara Ray, Sinclair, Arlo Dillman, and GerPeters. The 2013 edition boasts this line up: Ryan Curtis, Nate Greco, John Detrich, Eric Foust, Mark Thompson, Ruben Montes, Shawn Spiwak, Chainsaw Chuck, Johnny Jalopy, Dane Brown, Bradie O’Neal, Darren Menzies, John Hoogeveen, Chris Hamer, Del Swanson, Thomas Metcalf, Nik Scarlett, Dustin Weisgerber, Grant Cushman, Joey Finz, Chad Scheres, Jeff Schwerdtfeger, Ben DragDaddys Mitchell, Britt Madding, Ryan Curtis, Kurt Wright, Thomas Metcalf, Tom Krohne, Bruce Gossett, Ger Peters and Lil Nick. I’ve been going over the books for a couple of days now and I’m really impressed. There are some fantastic artists featured with a whole truck load of incredible art just waiting for your (or your child’s) coloring touch. 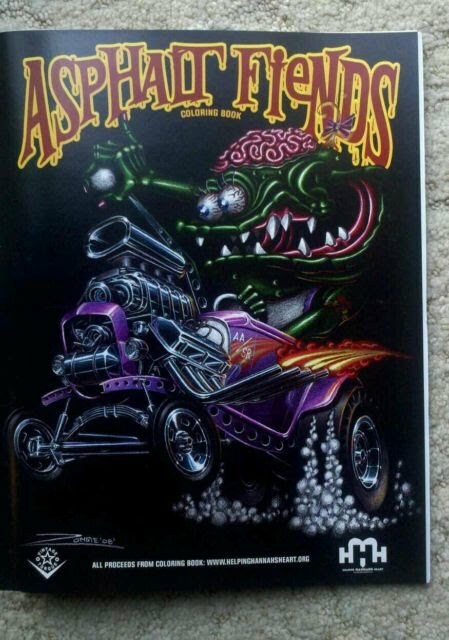 So get on over to Asphalt Fiends Coloring Books and get yourself some ordered. Get an extra to keep because these could easily be a great collector’s item. If you want to receive this blog in your email every time it goes live, just go to the top right hand corner of royboyproductions.com and add your email to the subscriber list!